THE MAYBELLINE STORY : Chelsea Clinton. Maybe I was born this way, Maybe it's Maybelline. Chelsea Clinton. Maybe I was born this way, Maybe it's Maybelline. Maybelline ad, from 1943 featured a young College girl, gearing up for a promising career. Wholesome and smart, with sparkling Maybelline eyes, this girl has what it takes to succeed, in what ever arena she chooses. I can't help be reminded of a young Chelsea Clinton. 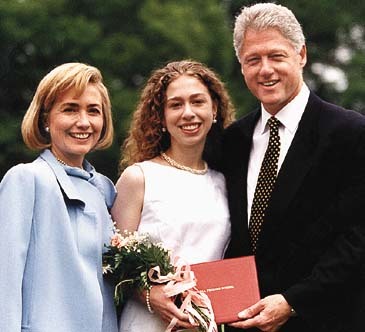 Chelsea Clinton with her parents, Hillary Rodham Clinton and President Bill Clinton, at her graduation. 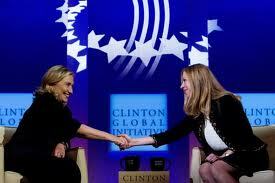 Chelsea Clinton had everything it takes to follow in her parents footsteps. A young Chelsea with her father, President Bill Clinton. Chelsea Clinton makes broadcast debut on NBC’s ‘Rock Center,’ This is exactly the type of girl, Maybelline was appealing to in 1943. Chelsea, Hillary and Bill Clinton Rock to Lady Gaga singing. "I WAS BORN THIS WAY." 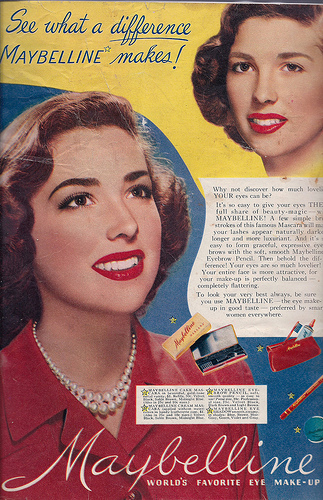 Maybelline side note: Hillary Clinton represented Maybelline in the suit against Noxwell.